Have a question for Railay Garden View Resort? "Beautiful view from the breakfast area." "Staff were lovely, great with the kids, showing them all the wildlife and giving them coconuts to drink." Located in the lovely area of Railay, Railay Garden View Resort enjoys a commanding position in the beaches, romance, sports hub of Krabi. From here, guests can enjoy easy access to all that the lively city has to offer. For sightseeing options and local attractions, one need not look far as the hotel enjoys close proximity to Real Rocks Climbing School & Shop, Railay Beach, Phra Nang Cave. At Railay Garden View Resort, the excellent service and superior facilities make for an unforgettable stay. To name a few of the hotel's facilities, there are free Wi-Fi in all rooms, 24-hour security, convenience store, daily housekeeping, postal service. All guest accommodations feature thoughtful amenities to ensure an unparalleled sense of comfort. The hotel offers an excellent variety of recreational facilities, including garden. Whatever your reason for visiting Krabi, the Railay Garden View Resort is the perfect venue for an exhilarating and exciting break away. 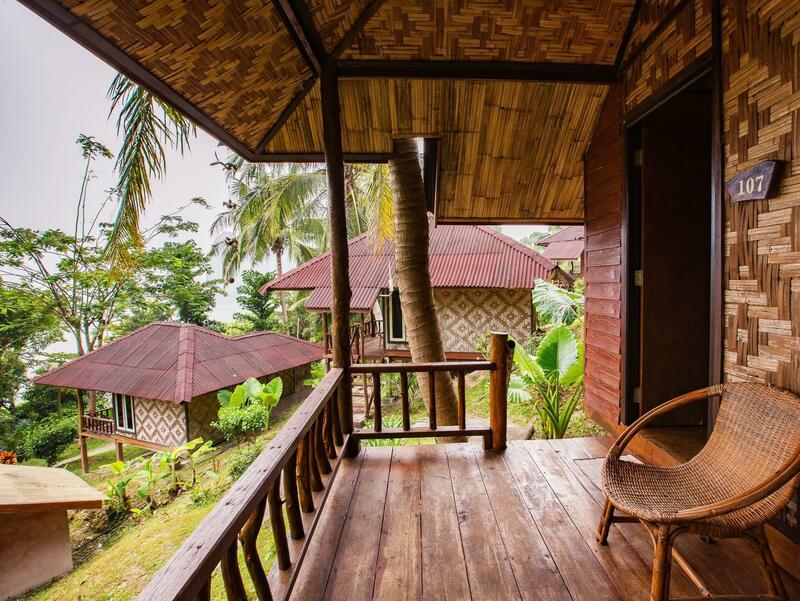 "We had an incredible panoramic view of railey and were so cl..."
The views from the individual rooms afford excellent sea views and, since the rooms are at tree top height, make perfect observations platforms for the jungle wildlife. The rooms are positioned to give a good sense of privacy. The staff are organised and efficient as well as being friendly and easy going. The breakfast option includes the best pineapple pancakes I've eaten in Thailand. Be aware that as part of the eco philosophy, there is no air conditioning or hot water and getting to my room involved climbing 107 steps, there is a luggage lift though. Only negative issue is the noise from the long tail boats, it's pretty relentless from 6.30am to after 11pm, otherwise this would be 100% perfect. Loved our short stay here,and would definitely stay here again. Things you may want to consider 1, no air con only a fan in the room 2, it’s a 15 min walk from the boat drop off 3, No hot water although this is refreshing in the heat The guys were all very helpful and friendly but for some reason Breakfast service was very poor This accomadation offers excellent value compared to other hotels in Railay and the points above should not put you off ,although no excuse for the poor breakfast service. Great location on Railay - at the far end of East Railay, far away from the crowds (but still only a 10-min walk to the best beack, railay west), good breakfast, and clean and well-designed bungalow. We enjoyed staying here. The staff is not very personable (or at least, that was our experience) but they are helpful. Amazing views to wake up to and wonderful noises from the birds. Breakfast is good - there’s 4 set options between different egg dishes, pancakes, and sausage. You have to walk up some steps to get to the bungalows, but if you don’t want to carry your luggage they have a trolley/elevator to bring it up. I guess another drawback is that you can hear the long tail boats running throughout the day, but that may be the case everywhere. Really good hotel. It’s calm and far from noises. The views are amazing! Really good staff and nice breakfast! Unfortunately they didn’t have space for me one more night it was full. I’ll be back for sure. Beautiful place so Green and picturesque. Just the bare basics here. No hot water and a dodgy showerhead, the occasional ants cruising by which is not a problem. Hey it's a grass hut for next to nothing in a small Paradise! Loved it. I can't believe people complain about places like these when they pay next to nothing and expect the world. Quite a steep walk (lots of stairs!) from the pier but SO worth it for the gorgeous setting and comfortable huts. A really special place. I ended up with a Sea view bungalow. Great view. We had a garden view bungalow but with a very nice view of the ocean. It felt like coming to a thai persons country house since it had little personal details. Comfy bed, the fan was enough for us even though it was 34 degrees in the daytime. Monkeys hung out on the roof and made beautiful sounds. Good pancakes and fruit for breakfast. Helpful staff. A bit of a walk up a hill but a necessary evil for that view. Would have been nice if you could buy some beers on the premises but it was really close to the nearest shop. I will definetly stay with them again. The bungalows are located on the far side of Railay peninsula, so it was about a 20 minute walk to Ao Phra Nang beach and Railay Beach. The hotel itself consisted of a series of bungalows situated on the side of the hill, with amazing views of the water. Breakfast was included, which made this place good value for money. My bungalow included an en-suite, and patio. There was no AC, but a fan that directly faced the bed. I felt very comfortable, and was impressed by the hotel and service. This place was one of the most beautiful I’ve ever seen. We had an incredible panoramic view of railey and were so close to the beach. It is 10 times better than one of those 5 star places on the beach specifically because its surrounded by nature and trees and has a picturesque view! The staff is so friendly and the food is tasty. The rooms are comfortable, clean and spacious and gives you the real thailand vibe. There are a few stairs up to the place but there is a lift for luggage. Only the elderly or those people who like to moan will have a problem! So so beautiful and you will not regret it. (+) cute little bungalow, clean, and adorable (-) got a look upon checked-in from hotel staff when he learned that I travel solo. Also, got a rude comment about how he wants to sleep with me off handedly. 🙄 Room is not air- conditioned, they have a fan though. PROS: Fantastic view from our 'sea view' bungalow. CONS: Very-very noisy area 24 hours a day. Be ready to hear long-tails motor noises during ALL NIGTHS you stay there. No conditioner in the room, a fan only is. NO warm shower water in the bathroom. Perfect location to chill in the hill and relax while seeing beautiful view of the sea & island but you will hate to go up and down too many time because the slope of stairs are too steep but I love the room, so clean and comfortable. The only thing I hate is shower, the water running too light, difficult to wash sand and no water heater. We came to Railay with the intention of staying a couple days and doing a little rock climbing. We ended up extending to a week in Railay mostly because of these beautiful bungalows. They sit about 50m above the sea and provide a beautiful view of the bay. The bungalows are clean and comfortable and all of the staff is superb. Can’t recommend this place enough! I really really love it. Unfortunate that I just stayed here for one night. The staff are very friendly and they well informed everything. The room is clean. There is no a/c, but it’s not a problem at all. I couldn’t recognize this more. We booked a garden view room, but ended up with a water view! Just absolutely gorgeous. Lots of stairs to get up to the hotel, but totally worth it! Free water bottle fill up was also a plus. 15 minute walk to basically anything on the "island." My girlfriend and I really enjoyed our stay at Garden View Railay. We have been backpacking through Southeast Asia and ended up spending a month in Railay Beach partially due to how much we enjoyed spending time here. The rooms were neat and charming, and staff was friendly and helpful. Our bungalow had a beautiful ocean and limestone view. Our favorite part was waking up to see a family of spectacled langurs feeding on garden leaves from our porch. Thank you for giving us a beautiful space to stay in that was so close to the wildlife!